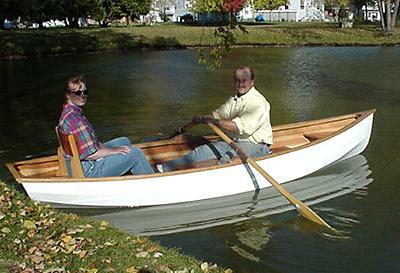 Most small boats designed for serious rowing tend to feel "tippy". The wide bottom on the FIFE makes her remarkably stable. People who normally feel unconfortable in small boats will find FIFE comforting. The skeg allows her to row true even with an inexperienced oarsman. Her ample watertight storage under the fore and aft seats provide room for extra clothing or picnic supplies. 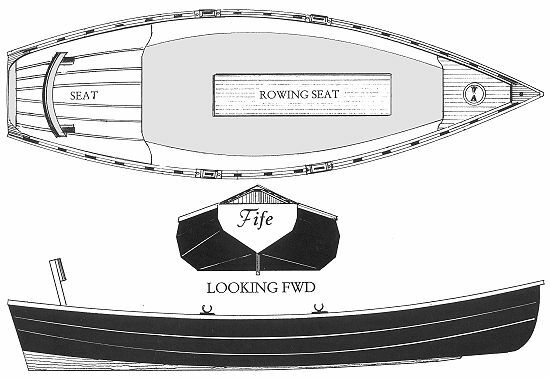 The design criteria for the 12' FIFE was that it could be carried, easily rowed, carry three people, and be stable. FIFE is lightweight (the test model weighed only 98 lbs. including fiberglass), with a wide bottom for stability and to maximize bouyancy. The hull depth was kept to 13" to minimize windage. 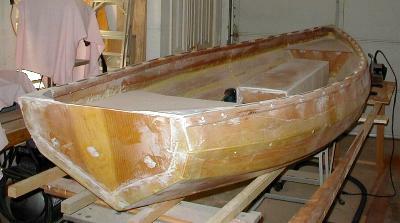 The rounded sides and tumblehome make this a very stiff boat even using light weight 4mm material on the sides. The waterline is at 3" with a 130 lb. load; 3 1/2" with 190 lbs., 5" with 395 lbs., 6" with 540 lbs. Plenty of capacity for you, a friend, and a hefty picnic basket. With two sets of movable oar lock sockets, the rower's seat allows the oarsman to change position with different passenger weights or when a passenger sits in the comfortable stern seat. Viewed from aft, she has a traditional "wine glass" stern. The lines guarantee that anywhere FIFE goes, she will get many more than a second glance. Performance report: An inexperienced oarsman rowed one passenger around the harbor for over 2 1/2 hours without fatigue. There seemed to be little additional effort required with two passengers. 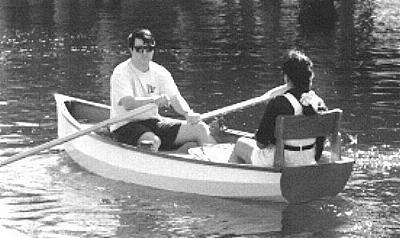 With two passengers, the oarsman used the aft oar locks, allowing the forward passenter to sit on the front of the rower's seat and face forward. 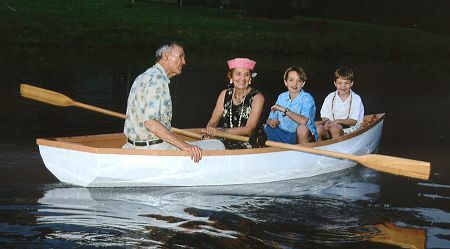 After finishing my son's Squirt, I was looking for a reason to build another boat, when my mother mentioned she had always wanted her own rowboat. So I quickly went to your website and started looking. 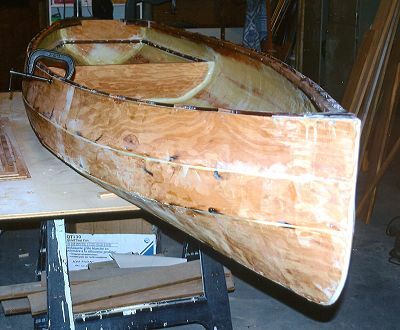 There I found... my next project, "The Fife"... A classic looking 12' long rowboat that would fit the bill perfectly. The goal was to have it ready for her 80th birthday, (yes 80th). And you can see from the pictures it was finished in time and what a hit it was. 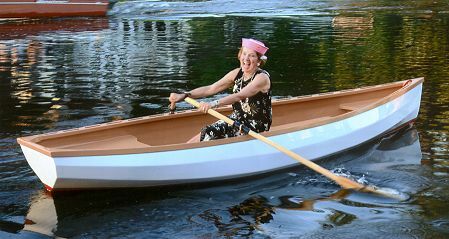 She loves the boat and the ease with which it rows. It glides over the water perfectly and has that timeless look of the boats she rowed as a child on the Puget Sound here in Washington. She's taken grandchildren, friends and my dad for rides. This boat has brought her a lot of joy. Thanks for helping me make my mom's 80th birthday a success. Hull weight (approx.) 100 lbs.